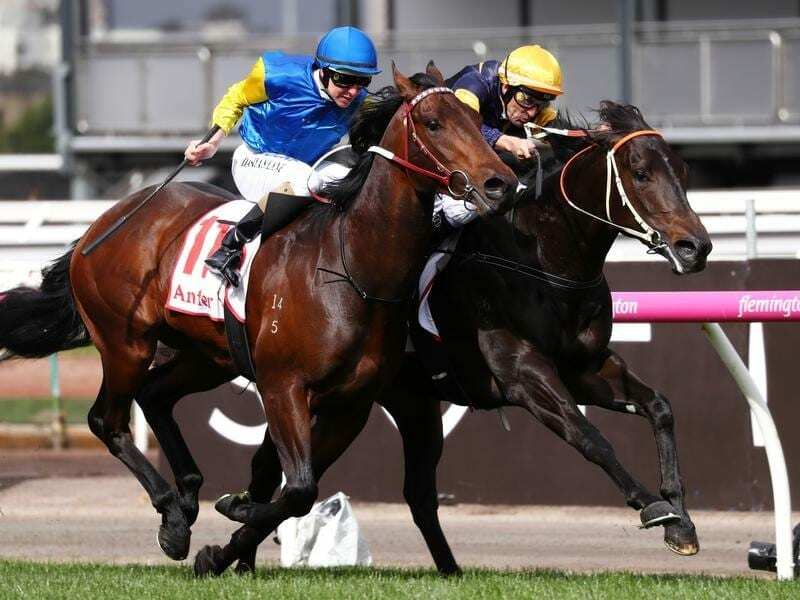 Brutal (right) has passed a crucial test in keeping an unbeaten record with a Flemington win. A number of options are on the table for Brutal after the colt remains unbeaten with another fighting win at Flemington. After chasing down the leader at Moonee Valley last month, Brutal lead from the outset to claim his first 1400m victory in the Antler Luggage Plate on Saturday. Pushed along from his inside draw by Dwayne Dunn, Brutal, the $2.90 favourite, fought back after being headed by runner-up Leonardo Da Hinchi ($10) to win by a half-head. Good ‘N’ Fast ($10) was a further 1-1/4 lengths away third. Co-trainer Wayne Hakes said a decision was likely on Monday in which direction the stable takes with the three-year-old. Options include backing up next Saturday in the Golden Rose at Rosehill, pressing on towards the Caulfield Guineas (1600m) or freshening for the Coolmore Stud Stakes (1200m) at Flemington in November. Hawkes even indicated the stable could send the colt for a spell. “Those races are there and they’re very tempting, but we’re going to let him tell us what he wants to do,” Hawkes said. Hawkes said Brutal had to do it the tough way on Saturday by leading and racing into a fierce headwind. “You don’t make excuses when they win and that is what he is, a winner,” Hawkes said. “He’s not the fully furnished racehorse but he’s had three starts for three wins.